The Manual of Official Procedure of the Government of Canada (volume 1) and its Appendices (volume 2) consist of 17 chapters/subjects, each of which breaks down the subject into 5 sections: I-Position, II-Background, III-Procedure, IV-Ceremonial, V-Appendices. Volume 1 contains the Position, Background, Procedure, and Ceremonial; Volume 2 is the Appendices. I have uploaded the complete and unabridged versions of these two volumes as two large files. In the Chicago style (i.e., the only good one! ), the Manual should be cited in the following format for bibliographies and footnotes, respectively. Canada. Privy Council Office. 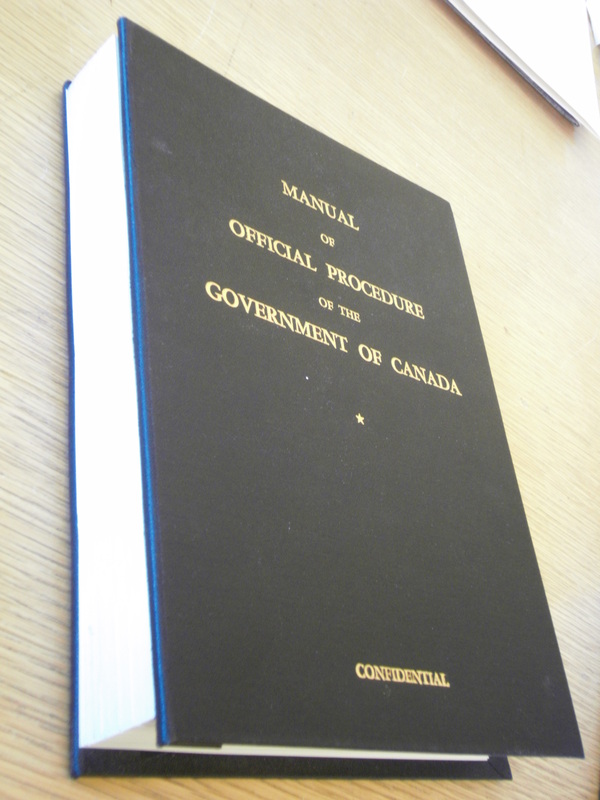 Manual of Official Procedure of the Government of Canada, Henry F. Davis and André Millar. Ottawa: Government of Canada, 1968. For ease of reference and downloading, I have also broken down each of the 17 chapters/subjects and all 5 of their sections into 17 separate PDFs, which thus combine the material of each chapter from Volume 1 and Volume 2. All five parts of the Manual and the Appendices (I-Position, II-Background, III-Procedure, IV-Ceremonial, V-Appendices) for each chapter now appear in one document. Added together, these 17 PDFs would also form a complete and unabridged copy of both the Manual and the Appendices. I have, however, rearranged the order of the chapters into what I consider a more intuitive layout. (For example, I have arranged “Government”, “Cabinet”, and “Prime Minister” together in the list. I also put “Parliament”, “House of Commons”, and “Senate” together). I am interested in the possibility that there might have been a power struggle between the Prime Minister and the Governor General with respect to Reserve Powers. If so, part of the Manual of Official Procedure of the Government of Canada, written by civil servants at the request of Prime Minister Pearson, could be regarded as a rule book written by one of the two contestants. Could there be any validity to this line of thinking?